Coconut is one of the most versatile Paleo kitchen staples around: from one plant, you can have a stable high-heat cooking oil, a creamy dairy substitute, a crunchy snack, a gluten-free, low-carb flour substitute, and a delicious “butter” to eat straight off the spoon. It’s got all kinds of nutritional benefits, and the fat in coconut products is one of the best fats around. But as great as coconut is, it still isn’t perfect for everyone. So here’s a look at the benefits, but also the potential downsides and a few reasons why you might want to hold off. 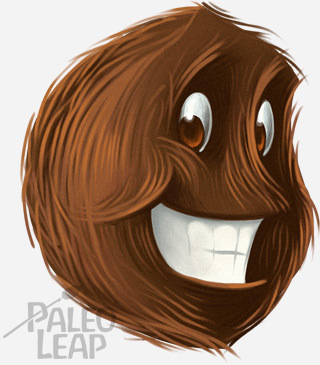 Coconut is popular with the Paleo crowd for a few reasons. One of the biggest is the fat: Paleo puts a huge emphasis on high-quality fats, and coconut is a great way to get them. The calories in coconut are mostly from fat, with most of the carbohydrate coming from fiber. And the fat in coconuts is very healthy from a Paleo standpoint. Coconut fat is 92% saturated, with very little inflammatory Omega-6 PUFA. From a Paleo standpoint, saturated fat from whole foods isn’t actually something to be afraid of (you can read more about this here). In fact, contrary to all conventional wisdom, there’s actually quite a bit of evidence that coconut oil is cardioprotective and helps maintain healthy blood lipids and cholesterol levels (that study is an association study, but it’s free full-text and if you read the beginning there’s a great summary of previous intervention studies). More specifically, the fat in coconut is rich in a type of fat called medium-chain triglycerides (MCTs for short). MCTs are very easy to digest. Unlike other types of fats, they don’t need to be broken down before they’re used for energy, and they don’t require any extra energy to digest or absorb. They’re great for quick energy, because they take a kind of biological shortcut from your mouth to providing you with fuel. MCTs are also helpful for people who have trouble digesting fats, or who have malabsorption issues in general. They’re particularly good for gallbladder problems, because they don’t require any bile salts (produced in the gallbladder) to digest. So some people who have trouble digesting other types of fat (like people who have gallbladder problems, or have had their gallbladder removed) can manage MCT-rich coconut oil just fine. MCTs are also particularly helpful for people on a ketogenic diet (extremely low-carb, low-protein, and high-fat). Because of the way they’re metabolized, MCTs are even more ketogenic than most other types of fat. In fact, adding MCTs to a ketogenic diet can even let you get away with a little more protein and/or carbohydrates as a percentage of calories. On the other hand, it’s not actually clear whether there’s a benefit to producing a huge amount of excess ketone bodies once you’re already solidly in ketosis. In long-term ketosis, it’s very normal for urinary ketones to decrease. It doesn’t mean you’re going out of ketosis; it means your body is getting better at estimating your energy needs, and producing fewer extra ketones that just come out into the toilet. That’s a benefit, not a problem, and constantly producing a huge number of excess ketones that you don’t even use might be dangerous, especially in the long term. Many coconut products are also rich in antioxidants. Unrefined or “virgin” coconut oil (with a strong coconutty taste), coconut water, fresh raw coconut, and coconut milk are all antioxidant-rich. The big exception here is refined coconut oil (without a strong coconut taste), which doesn’t have the coconut antioxidants. Coconut antioxidants are pretty powerful! For example, this study found that, at least in mice, coconut oil improved the ability of the mice to stay healthy under stress. The authors put it down to the combination of MCTs and antioxidants in the coconut oil. 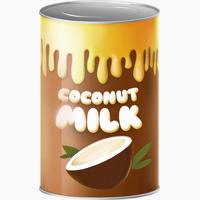 Additives in coconut milk: if you’re reacting to coconut milk with guar gum or carageenan in it, it might not be the coconut at all. Coconut allergy. It’s always possible to be allergic to the stuff. Coconut isn’t a “nut” so many people with nut allergies can actually eat it just fine. 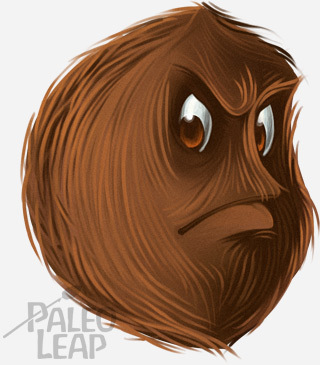 But some people also have a particular allergy to coconut specifically. Fat causing digestive problems. Yes, the same fats that have so many health benefits can have drawbacks too. Coconut oil in particular can cause diarrhea if you suddenly start putting back a lot of it when you hadn’t been eating much before. If this is you, it often helps to start slowly and gradually work up to a higher consumption level. Salicylates. Coconut is rich in salicylates, and some people react to them. Compared to cosmetics and medications, food provides a relatively small dose of salicylate exposure, but for people who are very sensitive, it might be enough to trigger symptoms. If coconut doesn’t work for you, here’s how to replace it with Paleo alternatives. Coconut oil also doesn’t supply any important micronutrients, like vitamins and minerals. The fat it contains can enhance absorption of fat-soluble vitamins like A, D, E, and K, but if you’re looking for micronutrient content you’re going to have to look somewhere else. Your own body is the ultimate authority on which foods are good for you and which aren’t – most people do just fine with coconut oil, but it’s always perfectly possible that it’s just not a good fit for you. And even if it’s theoretically the most nutritious food in the world, a food that gives you constant diarrhea and stomach pains isn’t a good food for you.